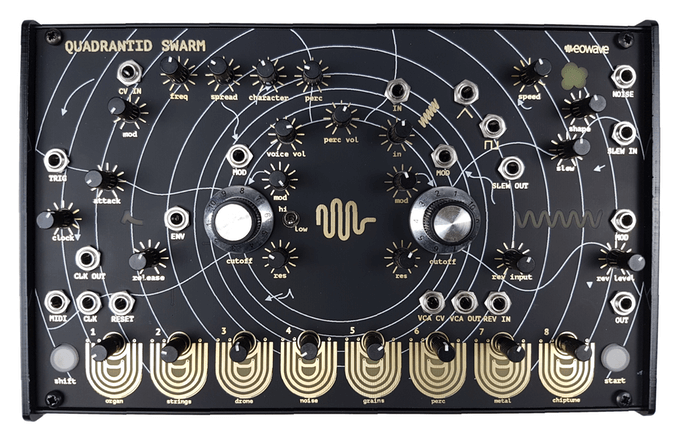 The Quadrantid Swarm Synthesizer is an experimental touch synthesizer created by eowave. It encourages you to explore sound design and music with a direct and inspiring set of synthesis and sequencing tools. It is on Kickstarter, and, at the time I am writing this, has 22 days to go. The Quadrantid Swarm Synthesizer is a desktop touch synthesizer aimed at sound designers and musicians who are looking for an expressive tool to explore rich and unusual soundscapes with a direct intuitive approach. 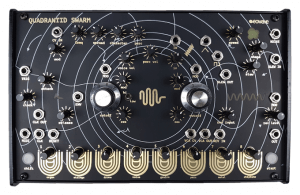 The Quadrantid Swarm is an instrument that has been designed openly – to be used with MIDI, alongside your modular synthesizer/CV sequencer or to be explored as a standalone drone/sequencer/generative synthesizer. It has 8 modes that eowave encourages you to consider as a springboard for musical inspiration, rather than a preset. The modes are: Organ, Strings, Drone, Noise, Grains, Perc, Metal, and Chiptune. These modes are not direct emulations of existing instruments, but they borrow on inspiration from their namesakes.